“To Paddy’s Whiskers….thank you so much for your wonderful music and for helping to create such a warm atmosphere at our wedding” (Penny & Bill). Romantic sparkly acoustic music for ceremonies and drinks receptions. An evening gig, ceilidh or barn dance from a footstomping band. DJ with a spectacular lighting show for the end of the night party. Your own choice of background music on your special day. Andrew and Jules from the band play a set of romantic sparkly acoustic tunes that create a lovely atmosphere for wedding ceremonies and drinks receptions. Specialising in renditions of wedding classics and folk tunes such as “Haste To The Wedding” and “Mairi’s Wedding” we can provide music as your guests assemble and the bride walks up the aisle, or as the champagne flows after the ceremony. Ceilidh, Barn Dance or Gig? In the evening, you and your guests can dance and sing along to the best live Irish, Scottish and American/Bluegrass music as Paddy’s Whiskers play for you. For those wishing for a full barn dance or ceilidh then we have a caller who can show guests the different dances with fun and light hearted humour. Our ceilidhs and barn dances are a great way for wedding guests to party together – by the end of the night everybody has danced with everybody else! We even have a unique wedding dance created especially for Paddy’s Whiskers called “The Whiskers Wedding Arch”. More information on Paddy’s Whiskers’ ceilidhs and barn dances here. Andrew from the band is also a DJ so we can provide a disco for later stages of the party. He has a wide range of music from the usual hits and disco classics, through to more unusual funky folk, electro-swing, dance and world music. He is happy to take playlists and requests and always seek to play music that suits the bride and groom’s tastes .. If Paddy’s Whiskers are playing for you, then we can provide our PA earlier in the day for subtle background music of your choice during your wedding breakfast. We can also bring a radio microphone for speeches and announcements. If you’d like to book Paddy’s Whiskers for your wedding or want more information please email us at info@paddyswhiskers.co.uk or telephone Andrew or Jules on 07514064558. 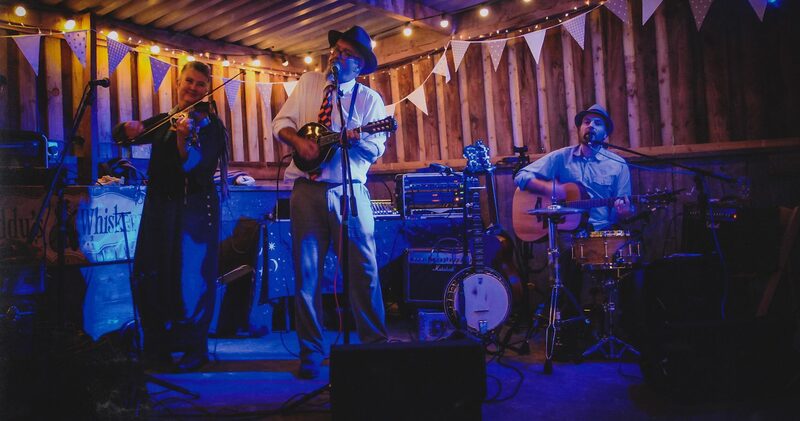 Paddy’s Whiskers are busy playing gigs, barn dances and ceilidhs throught Devon and across the South West – why not give us a call and come along to one? Donya + Chris from Authentic Videos on Vimeo. “Thank you so much for a fantastic time at our wedding party. Everybody commented on how much they enjoyed the music.”(Gareth & Erica). “Thanks very much again for the great live music and disco at our wedding last Saturday. We had a really good time, everyone loved the music and it gave us the chance to get rid of all that adreneline!” (Alan & Archika). Email: info@paddyswhiskers.co.uk Tel: 01803 520798 – 07514064558.